By LUDWIG VON KOOPA - Koopa down! Koopa down! The fine folks at Nintendo Treehouse Live are now showing us Mario Party: Star Rush, a new Mario Party game for the 3DS! It's really the first sign of the plumber we've seen at E3. ...Read the log to find out where he went! I remember a few E3s ago, you were so disgusted with the franchise that I couldn't even get you to watch the trailer for Mario Party 10. I think I was justified with that. This is the main mode? 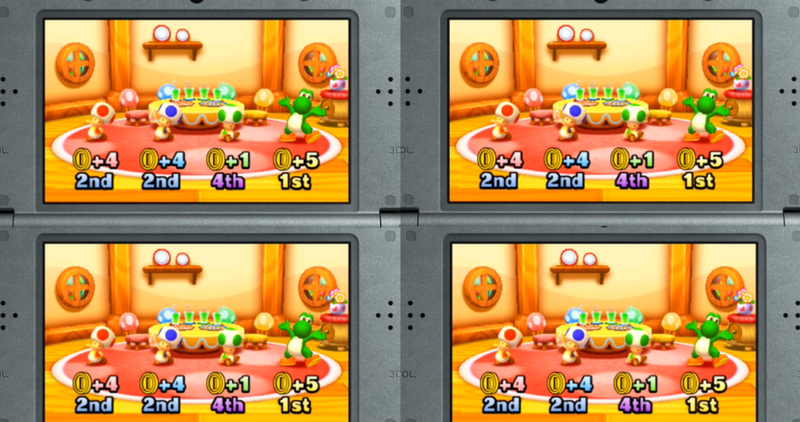 Generic Toads infectin' mah Mario Party. ">:o"
Do you have to buy amiibos to unlock actual characters? Loading screen features Mari0 harassing non-existantly-animated Koopa shells. There are bosses. 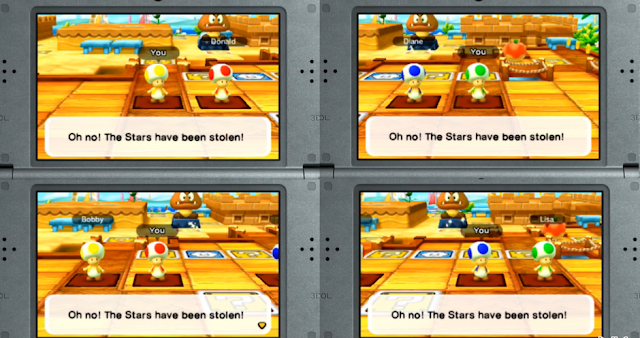 Mega Goomba stole a star. Red Toad is named Donald. As you wish. Hi Donald! Treehousers don't know which generic Toad is which Treehouser. "I'm gonna hold back my Toad Love." "You're always doing something fun. That's new to the series." "Oh, phew! Some allies have arrived!" You recruit allies by going to their space. Mario looks like he's put on weight. Is this like MP3's Duel Mode? The Mega Goomba is asleep in the minigame. Though he was wide awake on the map. "You're never waiting to have fun in this game." Toads are stealing Mega Goomba's apples. She's bashing the Mario Party's past pretty hard. The little Goombas are unsuccessfully trying to stop the Toads. Mega Goomba awake and mad. Reminds me of Animal Crossing amiibo Festival. And no one liked that. are there mini-games not involving these boss dudes? They never showed the ally characters. Anyway, King Bob-Omb is here. "There's multiple bosses on one board/"
The players are more confused than we are. Peach does something with flower buds. "Play as Peach in minigames"
Waluigi's ability has 50% chance of getting a high number roll, and 50% chance of having coins stolen from you. They're attacking King Bob-Omb with cannons. King Bob-Omb is sort of inviting them to attack. But then he gets angry. His attack is giving the Toads more bombs to attack him with. This is the same exact thing as the last mini-game except reversed. You're giving the boss macguffins instead of stealing them. King Boo is now present. is this why it's called Star Rush? Because it's a Boss Rush? Daisy does the same thing as Peach. "take chances, for the audience." They're selecting a minigame to play. So there are non-boss games. This is a prisoner's dilemma game. Like that Chain Chomp mini-game from MP3. It's not determined by RNG. They made a Yoshi's Cookie joke. If you haven't played Yoshi's Cookie, you're not missing anything. A-Aren't you reading my stuff? I said they're non-existently animated. And Mari0 jumps on them. Luig1's special ability is stomping on Goombas in grass? So the collecting allies thing is kinda like Smash Tour in Super Smash Bros. For Wii U. He said he was interested in this crap. I have to admit, I'm nodding off here. Hey, King Koopa hasn't shown up at all. Like the Acorn People in Conker's Pocket Tales? 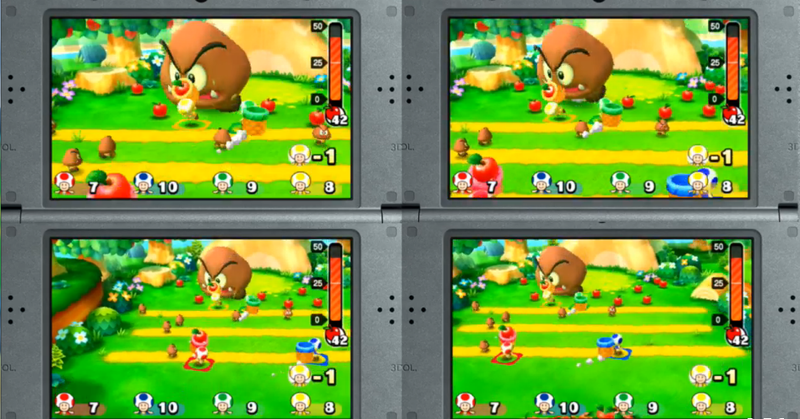 Oh, uh, this is a Goombrat-avoiding acorn-basket-running minigame. "Every moment, everyone is doing something. We're moving, we're planning, we're mashing A..."
is that why they don't like breaks between the streams? Blue is gonna get to DK. Donkey Kong's ability: Breaks B--..
Well, Donald probably likes it. That's the campest I've ever heard DK sound. I need to hear it again. Well, he's in this King Boo boss fight. "Oh, Donkey Kong's so sad about it." "That's probably a good place to end it." Maybe they'll talk about him. So THAT'S where he went! 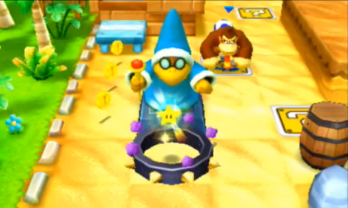 KAMEK STOP HARASSING GENERIC TOADS. WE HAVE CONTENT TO REACT TO! They quit once Kamek comes on. ...Does he know they're not coming back to him? WE CARE ABOUT YOU, KAMEK. Yokai Watch 2 up next. In the break, we'll try to get Kamek out of the 3DS. Will KoopaTV get Kamek back, or will he forever be trapped in the demo 3DS's sleep mode? Stay tuned! Click here for the previous reaction log article before this one. Kamek would later appear at E3 2018 in a Mario Party game. So how can a "Luigi Wins By Doing Absolutely Nothing" be done for this game?